Speaking of sprinters ...how about our guy Anthony Schwartz? 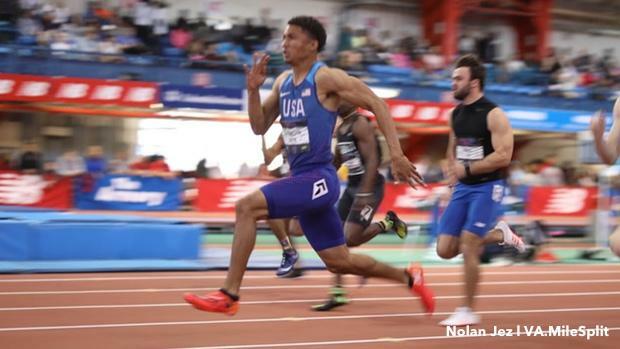 The future Auburn Tiger made running the 60m look downright pedestrian, going 6.63, 6.62 and 6.59 in ensuing rounds to score his first, and only, indoor title at New Balance Nationals Indoor on Sunday. His teammate, Tyson Campbell, was second overall in 6.72 seconds. Pa. state champion Austin Kratz, who would go on to win his first indoor title in the 200m in 21.01, was third in 6.72 seconds. Caleb Jackson and Mario Heslop were fourth and fifth, respectively, in 6.76 and 6.77 seconds. Brendon Stewart, who entered the weekend as the US No. 1 leader, was sixth in 6.79, earning the final All-American nod. Running at New Balance seemed like an obvious choice. The Plantation American Heritage (FL) High senior is eventually going to run indoors at Auburn, so experience at the venue would help. He was here competing for the first time, though. So it was fair to question whether he would transition well. Throughout the weekend, Schwartz mentioned how he had to adjust by shortening up his drive phase and focusing on his initial steps out of the blocks, which would kickstart his race sooner. By race day on Sunday, there weren't many problems. Schwartz dominated, scoring wins in his first two rounds and the final, prompting commentator and Olympian Trayvon Bromell, a Florida native who was former high school and college superstar, to comment that it took him until college to run 6.63 seconds in the 60m. While Schwartz didn't break the national record of 6.59 seconds, he showed a special gear that few have had -- or will have -- moving forward. So stay tuned for his story this spring.